New in the underwater world is a brand of high end video lights, designed with the discerning videographer in mind. Gone are the days when you have to limit yourself or choose one feature over another as these lights come jam packed with a variety of functions, in a well organized package with all the options most divers could want. The Kraken Sports Hydra lights offer a high quality flood beam for video shooting, spot beam for diving, signaling, red beam for focus and a UV beam as well. 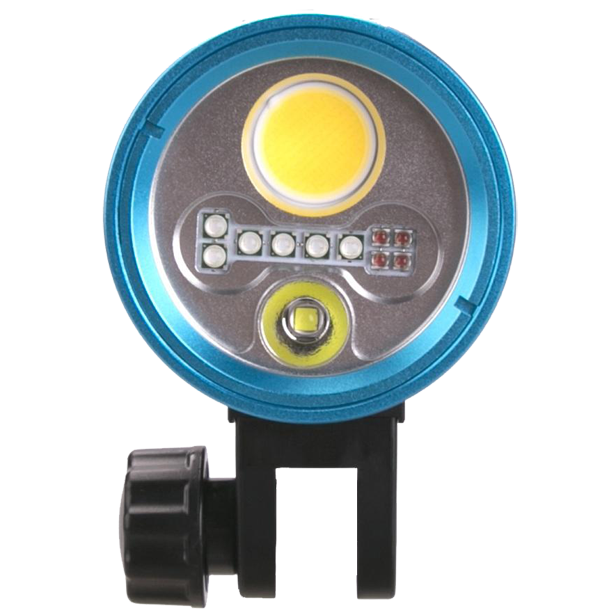 Easy to control with a dual button system these lights are well balanced underwater. The newer Solar Flare is a high end extremely powerful flood only video light, offering a very wide beam and high light intensity for those challenging to light conditions. 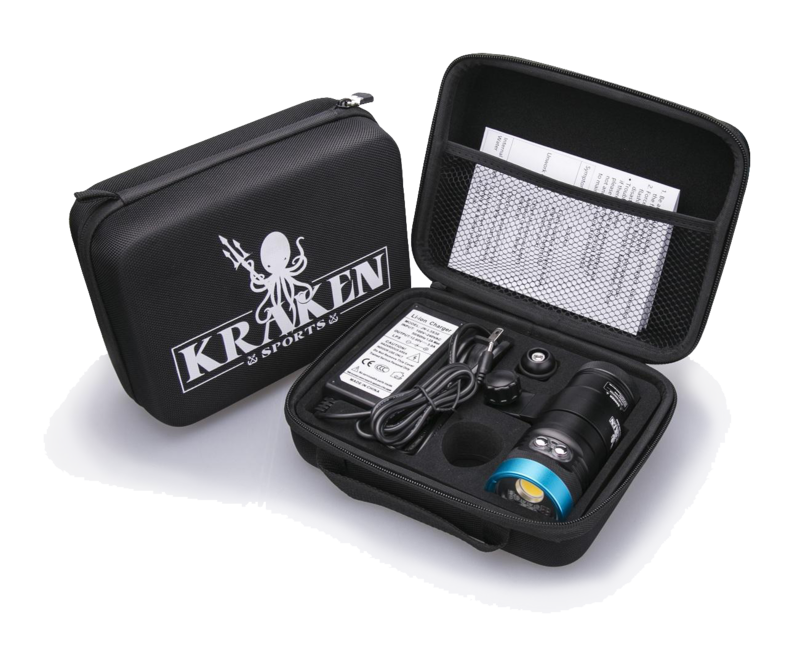 The Kraken lights offer a smooth beam with no hotspots, and a regulated output so that brightness remains the same thoughout the dive. Once the battery reaches a certain percentage, power will drop to 25% until the remainder of the battery life is cashed. Every light offers a sealed light head to prevent water intrusion in the case of a flood. This protects the expensive circuitry and LED's helping you keep your equipment functional in the worst of cases. The lights come with two popular video mounts, a ball mount or YS mount and even include a handy carrying case for easy of packing and travel. The minute you open the box you notice the really nice carrying case for the lights - then you open the case and the lights look very high end. Once you actually pick it up, it has a sturdy, well made, top of the line feel to it. The 2 button design is great, you use 1 button for light settings ( Flood, Spot, Red and UV ) and the other for the intensity of the selected lighting option. The buttons are easy to use with or without dive gloves. The charging time of the battery is amazing, 1.5-2 hrs and they are fully charged which is such a relief as with other lights I’ve used the charging time is as much as 8 hrs. Burn time on full power was 63 minutes which is on par with running time for most all lights. The light coverage is great and the actual light produced by the Hydra 5000 is a soft-smooth light, regardless of how close you get to take the picture. Another great thing is that even when the battery level got low, the light’s intensity didn’t seem to change. One concern was the initial weight of the light, but even without using floats I really couldn’t tell a real weight different on my rig underwater. Overall I think this is a great light that far exceeded my expectations and will have no problem competing and exceeding much more established dive light makers in the industry. Currently there are four Kraken light's available. Each offers slightly different power levels and features. Choose the best one to suit your needs. Hydra 3500 - The Hydra 3500 WRSU is one of the innovative multi-function lights from Kraken. 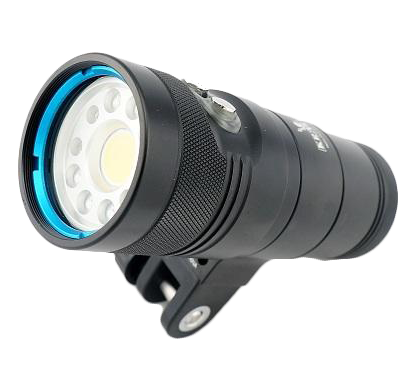 Featuring a max output of 3,500 lumens on high power, the light is adjustable in 25% increments. In addition there is an 800 lumen spot light, a Red focus beam and a UV beam as well. All of these features are packed into a nice compact body, with easy to replace battery making it an idea solution for any underwater videographer or photographer. You have a great video light, focus light, signaling light and creative UV options all in one! Hydra 5000 - In the same sized body as the Hydra 3500, the 5000 lumen model simply increases the overall intensity. Offering all the features of the 3500: flood, spot, red & UV, the Hydra 5000 increase the max power output to 5,000 lumens flood beam. The spot remains 800 lumens and the burn remains at 70 minuts (60 minutes full power before power drops to 25%). Hydra 2500 Macro - This video light is unique in that it doubles as strobe for macro photography. Connect the light to your camera via a fiber optic cable and fire a burst of 4,000 lumens light! 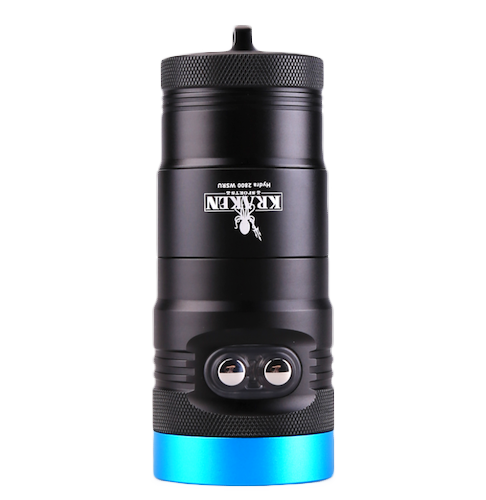 In addition to the unique burst flash mode, this is a great 2500 lumen video light which also features a red and UV beam for focus and ultraviolet shooting. Solar Flare Max - This light is in a class of it's own. With a high quality dome to help further disperse the beam angle of the lights, the Sola Flare gives videographers a 160° beam angle underwater, perfect coverage for even the most wide angle lens. 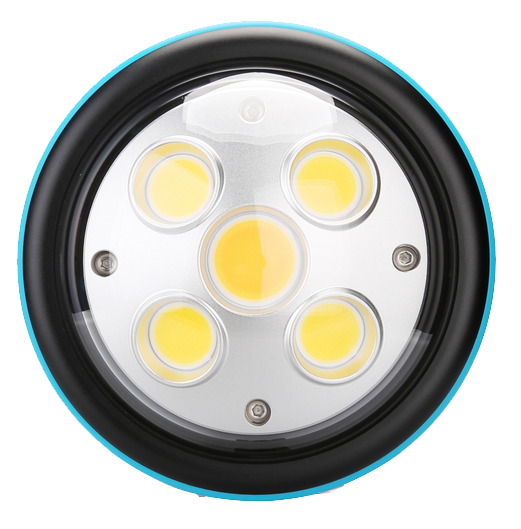 A stunning 10,000 lumens are delivered evenly for excellent lighting. Battery life is 50 minutes on full power, and with a sealed light head it is easy to safely replace the battery after the dive without risking a flooded light. We find these lights to be very well crafted and highly recommend them for any level shooter. With the high lumen output the lights can also perform well for shooting still images. While using a constant light source will have some limiations compared to shooting with a strobe for photography, the flexibility of using one light for both purposes is great. 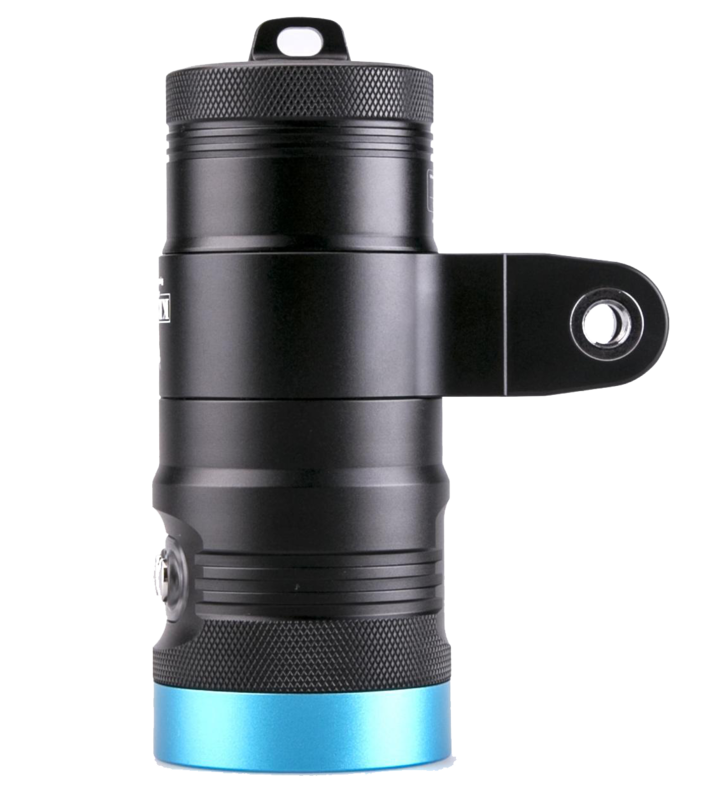 In addition, the multi purpose use of the Hydra series, offers shoots the ability to purchse one light for both focusing and video. Easy to charge, easy to control, and small for traveling make the Kraken lights a great choice for any underwater system. Check out the new Kraken Video lights - high end options full of useful features.